Its football Saturday at Sam Boyd Stadium and time for the “Ninth Island Showdown” as the Rainbow Warriors battle the Rebels of UNLV. The winner receives the rights to the Island Showdown Trophy, in the shape of a gold pineapple and nicknamed “The Ninth Island”. This award ceremony began in 2017 and now each year the pineapple will be on the field, with the winning team taking it home. 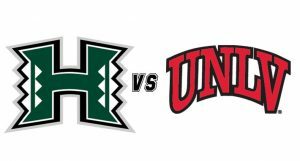 This is the ultimate face-off between Hawai’i and UNLV, marking a 50-year-old rivalry that began on October 25th, 1969. The schools have faced each other 28 times with the Rainbow Warriors leading the all-time series, 16-12. Football Saturday begins with the official pre-game UH Tailgate Party held in the Main Street Station parking lot, drawing over 1,000 Hawai’i fans. From there, it’s a short bus ride to Sam Boyd Stadium as the battle begins. After the UH victory, back to downtown Las Vegas to celebrate into the wee hours! If you have any doubts on how exciting this game will be, below, a headline from last year’s match-up. “Chevan Cordeiro leads Warriors to epic comeback over UNLV, into Hawaii Bowl”. Your escorted weekender package includes round trip air on Hawaiian Airlines, airport transfers, 4 nights at Fremont Hotel and Casino, official UH tailgate party, sideline game tickets, transfers to and from Sam Boyd Stadium, commemorative “Back in Black” t-shirt and all taxes and fees! Panda Travel staff will be on the ground all weekend to assist. Round trip airfare from Honolulu to Las Vegas via Hawaiian Airlines. Note: airline baggage fees are additional and paid directly to the carrier. Book with $200 non-refundable deposit per person. Final payment due by August 30th , 2019. Package is non-refundable after this date. Non-refundable deposits are only valid for the tour booked for and cannot be applied to another tour. *Please note: All rooms in our block only have 1 king bed. Rooms with 2 beds are not available during this period and roll-away beds are not permitted due to the size of the room. 11/17/19 – Depart Las Vegas on Hawaiian Airlines flight 5 at 5:30 pm and arrive in Honolulu at 10:00 pm. June 2-12, 2019Starting from $1,179 per person quadruple (4) occupancy in a Family Package (2 adults and 2 children under 21 years old). Standard room with 2 beds at each hotel. Ninth Island Showdown-Weekender #1 (Hawaiian Airlines & The Cal)-SOLD OUT!